Tuesday, September 8, 2015. After ten hours of sleep and a couple more to wake up and make some decisions, I walked to the bus stop for Laredo, the next stage. Continue to figure out how and where I’m going to cut what I now think are 225+ km from this walk, in order to get to Santiago by October 10. At the bus stop, I’m greeted by three other peregrinos, and as we board the bus to Laredo, two more join us. This will become my experience . . . hesitating at the bus stops every few days, only to be joined by at least two or three or six more people loaded down with backpacks and sticks. In this case, I begin to talk with a South African woman, Henrietta, who says she is headed to Laredo. My plan is to get the bus to somewhere, in this case Laredo, and then continue to walk. From Laredo the walkers must take a strange little boat to get over the canal or whatever it’s called, and reach the shores of Santoña before walk toward Noja and then Guemes. I think I’ll get to Noja today, despite the fact that I don’t begin in Santoña until after noon. The path is through town, where there is some sort of festival going on, and on to a path at the beach, then up and over a “little mountain” after which I am supposed to find an albergue in Noja. Great. Henrietta says she’s on board, I think only because she doesn’t want to walk at all today, but would rather walk with someone than stay in Laredo herself. So we have a coffee (of course) as we poke our way through the Santoña festival, and head toward the path on the beach. Beautiful days continue, though rain is threatening for the early part of the weekend. We cross the beach and go in the direction of a “hill”, the smallest of the mountains on the edge of the water, and begin to climb. 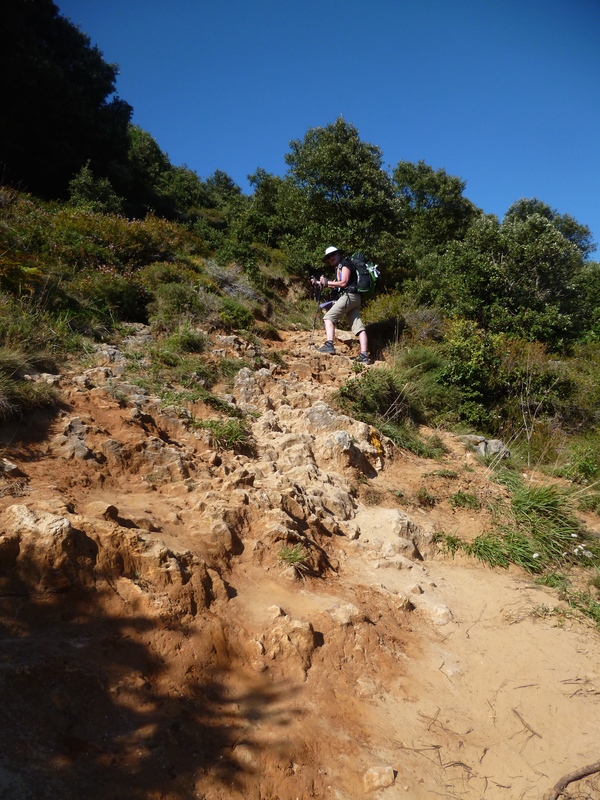 The track is not too long, but very steep and very narrow, with lots of sand and rocks on the way up, and dirt/rock on the way down. Henrietta as we walk up the “hill”. Sometimes I just have to sit down on the high rock and slide down to solid ground again. A Spanish peregrino I will meet in two days will refer to it as “cardiac hill”. Yep. But it is not endless, and ultimately we come to a promised beach on the other side, after which there is to be an albergue (a big blue building) and a town . . . (Noja). But there is nothing. Nothing but beach and sea. Gorgeous, as always, but not where I’d like to sleep tonight. We see some cars parked and people getting into the cars after their day at the beach. Trying to flag one of them down is impossible, and I finally just stand in the middle of the road. The car stops, rather than flatten me. Everyone in the car seems to speak some English, and they piece together some sort of solution for our “where is the albergue” dilemma. Somewhere down the road is Noja, but they aren’t sure there is an albergue there. And yes, the big blue building is “somewhere”, but they’re not sure where . . . maybe 1 km down the road is a little village. Perhaps the blue building is there. We persevere, and indeed there is a blue building, a bar and albergue, and we check in. with the not-so-charming owner. Lena, the Russian young woman from Pasai Donebane, is also here, and we have a chat before my shower. Imet her at the wash basin at our first stop, the albergue in Donibane San Juan where Pau was singing with and for us. She has the most beautiful fresh face. All and all a good day . . . the bus AND a good walk, the sea views, our requisite walk on sand. A quick dinner next door to the albergue, actually just pinxos and a tinto, before crashing. 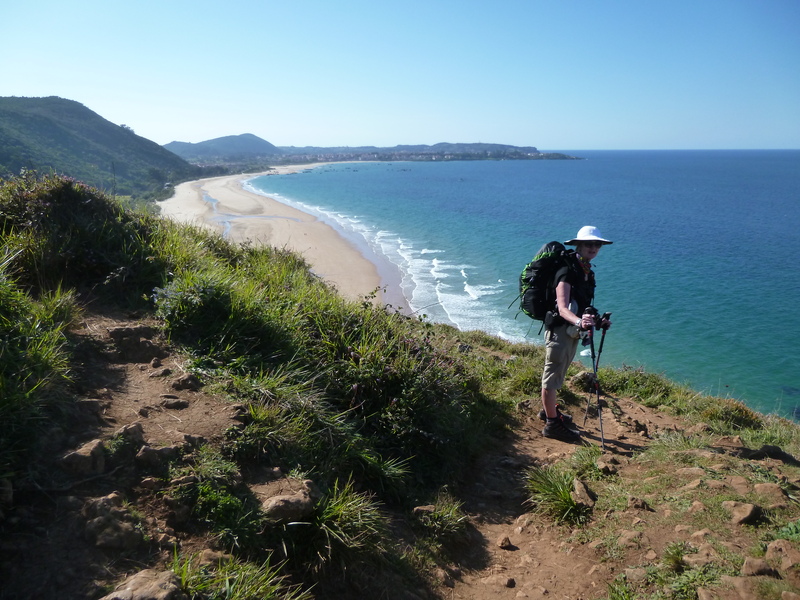 This entry was posted in Miscellany and tagged Beach Walking, Camino del Norte. Bookmark the permalink. Beautiful scenes of a faraway place! Am reassured that there was a blue building after all that….on your first Camino I remember a number of situations where arrows were confusing, places were sometimes not where they should have been…but you are doing the pilgrimage, with all its rocks and stones, steps and slips, climbs up and slides down the hills….as long as you are on the road, (or the occasional bus) you are getting’ there!! When you say you walked for 2 or 3 hours, I am trying to guess how FAR that takes you? 5 miles? 8? (I don’t know my km equivalents…). I do three on a treadmill, and am bored to tears…..and it takes nearly an hour….It’s one thing to imagine it, another to actually do it. You go girl. Well, the walking is slower going with 10kg (22 lbs.) on my back, and the terrain, but probably less boring than the treadmill. I remember those days. Three hours doesn’t get me far, but this particular day to the blue building, we probably walked (and climbed) for seven hours, but it only got us perhaps 12 km, which is about 7-1/2 miles. A bummer. Last time, I generally (after the first week or two) walked 20-25 kmm per day . . . maybe 13-15 miles, per day. But that’s not happening this time. I did walk 22 km yesterday, (.62 miles for every km), but it took me (with coffee breaks, lunch break, and bathroom breaks) about 9 hours. A lot of steep steep downhill paths on loose rock, and some asphalt walking, also hard on the feet. Apparently in some districts of Spain, one is not allowed to make a path through a field. But I’m in Asturias now, and they do allow it. We’ll see. So the operant word is to persevere…through challenges, disappointments, not pretty terain, bus trips that diminish our ambition. Carry on! Persevere, for we are following you all the way….stay safe! Good on ya. The Norte route seems harder? Ria went on to the next town since she was afraid there would be no rooms in Castro, ad she was right. We were on our own pats, ad a couple of days ago, we met u0 again, but I’ll write about that. I think we will be doing this hopscotch all along the way. But we will meet in Santiago on October 10 for sure, ad probably many other days. She wants to do no more than 25 km per day, and I want to do no more than 20 most days, because this is still very much hiking, no walking. More later, Jeanne . . .